Hello! Happy Friday! Have you been following along with the Spellbinder's To DIE For!! Winter Release Blog Frenzy this week? Yesterday (Day 4), Sherry Cheever, previewed two new products, including S4-312 Blossoms Three. Today, JustRite Stampers is previewing a new cling set, CL-02090 Friendship Blooms, which matches the Spellbinders S4-312 Blossoms Three die templates and the new S4-310 Labels Eighteen previewed by Debbie Olson on Day 1. My layout is inspired by Mojo Monday 173. 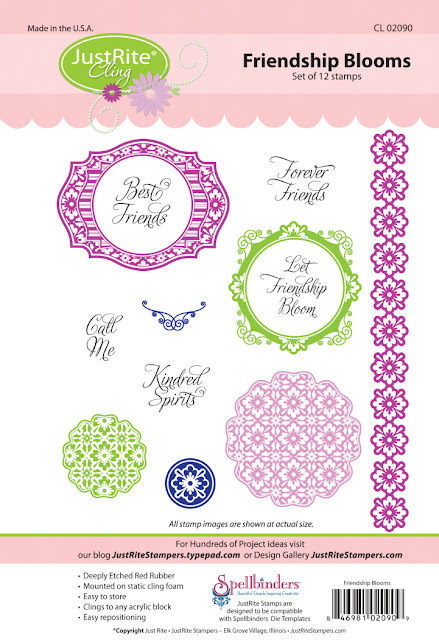 Accessories: Twizzle embossing folder (Sizzix), Ribbon (May Arts), Pearls (Kaisercraft), Foam tape, Thread, Sewing machine. What a gorgeous sample with a fabulous new set Steph!! Love the colors and how you made the sweet little medallions on the side!! Beautiful and charming! Gorgeous card, Steph -- love the colors! Oh so pretty Stephanie! 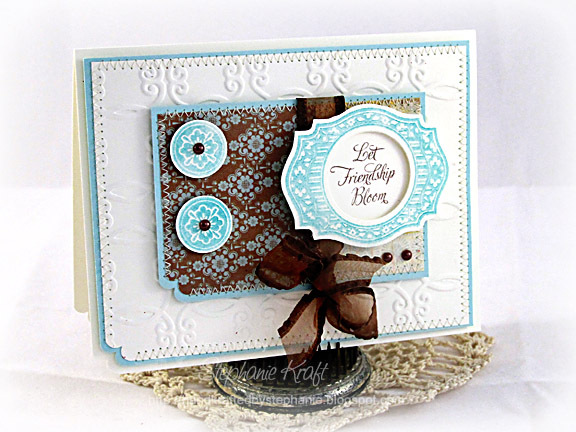 Love the pretty color combo and those gorgeous new stamps that coordinate with the new Spellbinders dies! Wonderful Stephanie, love the colors, your stitching is fabulous! Love these colors together so much too, Stephanie, and sooo thrilled to see these AWESOME new stamp sets & coordinating SB dies -- Woo-Hoo!!! 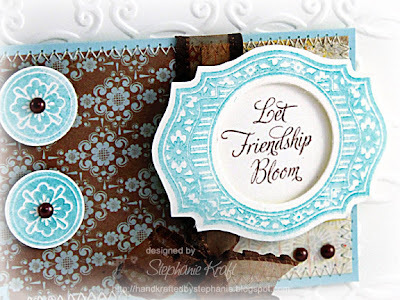 Fabulous colour combination and beautiful stamps. Great card! Love the card Stephanie.I've visited often but never left a post. I love turquoise, brown and white together!